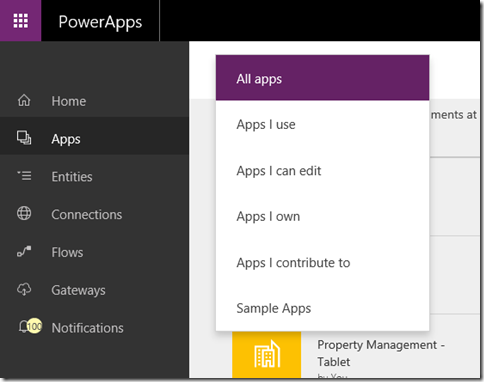 powerapps.com has been the place for you to find the apps you created with PowerApps or apps others have shared with you. However, that experience has not been ideal since the app list grows large pretty quickly. So many apps are pushed to you automatically via sharing with the security groups you belong to, or sharing with your entire organization. This makes it difficult for you as a creator to get started as well as collaborate quickly. Today, we are changing that experience to not only help you to navigate quickly through your apps but also de-clutter your app list. What’s new with app sharing? The app sharing experience is simplified. Previously, you can share an app with three different levels of permission: Can use, Can use and share, and Can edit. Now we simplified this model and give you two levels of permission: User and Contributor. When an app is shared with User permission, you can run the app but not share the app with other users nor edit the app. When an app is shared with Contributor permission, you can run or edit the app as well as further share the app with other users in your organization. When you land on the Apps page on powerapps.com today, by default, we only shows you the apps that you have edit permissions on. This includes all the apps you created or apps shared with you with Contributor permission. This default app list view is no longer the long list of all the apps you ever have permission to. We want to shift powerapps.com to be the home of app creators; enable you to quickly navigate, open and make changes to the apps you own or apps you collaborate with others. This means clicking on an app will open them in edit mode on PowerApps Studio for the web instead of running them directly on the web like before. You still have options to run them or view other app details by clicking the ellipsis on an individual app. 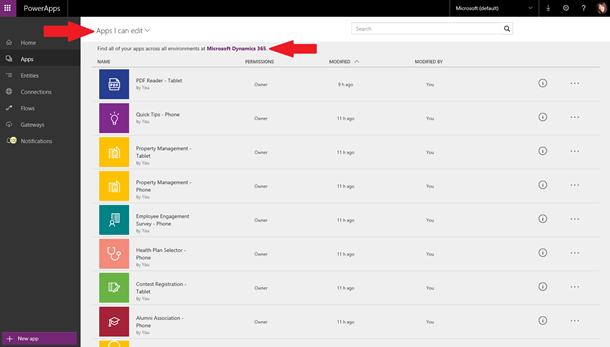 For all other apps shared with you with User permission, you can access them by clicking the app link on the share email or acquiring them via AppSource’s organization gallery on Dynamics 365, our new home for a wide range of business applications. 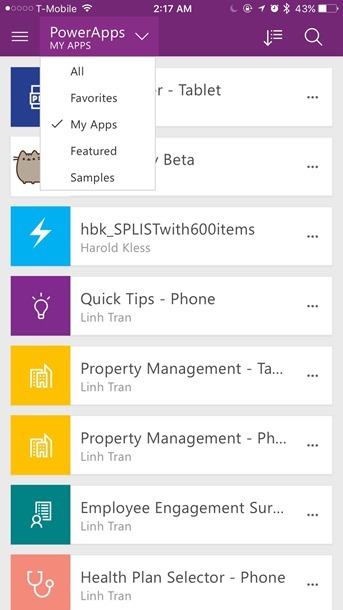 You can also access them on powerapps.com via All apps filter and use the search function on the Apps page. However, we are shifting the experience to make powerapps.com the home for creators of PowerApps, while Dynamics 365 becomes the new home for you to consume all of your business apps. I encourage you to read the introduction to our new Dynamics 365 Home here, where you will learn what Dynamics 365 means for users of PowerApps. 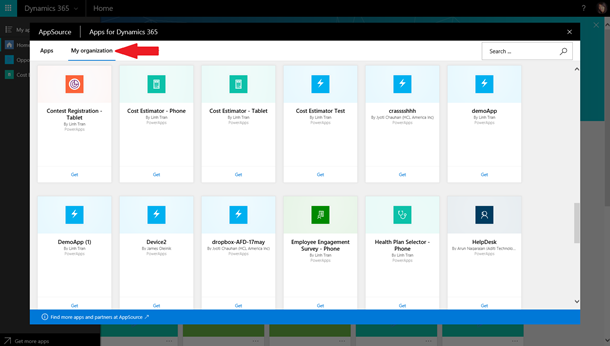 With the announcement of PowerApps environments, your app list on powerapps.com will only show the apps in the currently selected environment. The environment dropdown on powerapps.com shows all the environments you have access to, including the environments you create yourself or the ones you are granted access to. When a user shares an app with you, the environment the app belongs to is added to your environment dropdown. On PowerApps mobile client, the app list, however, is a little bit different. By default, the app list on PowerApps mobile client shows all apps that you have access to across all environments. You can sort this list by last Modified date, last Open date or by Name but you cannot filter this list by environment on the PowerApps mobile client. Read more about app sharing and checkout the new experiences on powerapps.com.